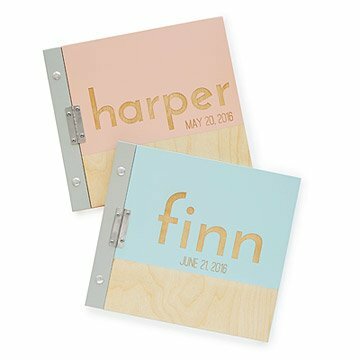 Capture moments of new baby bliss with this handmade, personalized photo album with a wooden cover. Picture this. And that. Oh, and that, too. For every captured moment of new baby bliss there is this handmade photo album by Kerri Lee. A laser-engraved, wooden cover comes personalized with the child's name (up to 10 characters) and (optional) date of birth--or just "baby" if details are still a mystery. Each page also has a small area for writing captions, dates and other special notes. Holds up to 40 4x6" photos. Made in the Southern Catskills of New York. Engineer and designer Kerri Lee-Sensiba's earliest pieces started at her kitchen table, where she would often work through the night. Her designs were born from her desire to create gifts for children with innovative features, artful details, and simple beauty. She began exhibiting at trade shows, and her products quickly garnered national attention and acclaim. Today, Kerri and her team craft their sustainably made designs out of a century-old building in a small New York town along the Delaware River. This is a made-to-order item. If you order today your item will ship no later than 5/15/2019. When it comes to being a Mom, I am most certainly NOT a Pinterest Mom. I don't have a crafty bone in my body. This photo album was perfect for us. It's sweet, it's simple, it's easy, and it shows off our little one's first year beautifully. The gift was a hit! This gift was beautifully crafted. It is simple, elegant and will last this young child's whole life long! The recipient of this album absolutely loved it. This custom photo album was purchased for my daughter for my first grandchild. The album is of high quality and everything I hoped it would be. This is a lifelong treasure for both parents and child. Beautifully made unique keepsake photo album perfect for shower gift! It was a gift, and they loved it! My niece likes to take photos, so I thought this would be a great baby gift for their new daughter. I didn't see the actual album because they live out of state, but my niece told me it was beautiful and that she loved the wood fragrance (due to the wood cover).